Norway's sovereign wealth fund, the Government Pension Fund Global, has been a leader in forging a new approach to the outward projection of state authority through global private activities. Norway has provided an architecture of governance that sits astride the borders of market and state, of public and private and of national and international. Undertaken through its sovereign wealth fund, Norway is seeking not merely to project public wealth into private global markets, but also to construct a complex rule-of-law centered framework that blends the imperatives of a state based public policy with a rules based governance system that incorporates domestic and international norms. To this Norway adds a policy-oriented use of traditional shareholder power to affect the behavior and governance of companies in which the Fund has invested. (Explored HERE). Critical to the success of the the project of public regulatory governance through state activities as a private actor, has been the institutionalization of rules for active shareholding where the state, through its SWF, owns an equity stake in a private enterprise. Norway had been quite transparent in this effort. 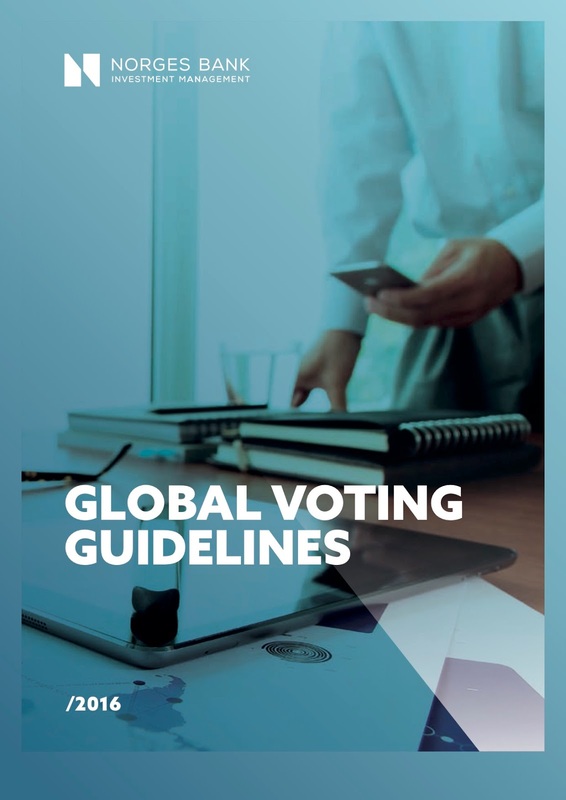 In 2016 the Pension Fund Global Investments manager, Norges Bank, distributed its Global Voting Guidelines. 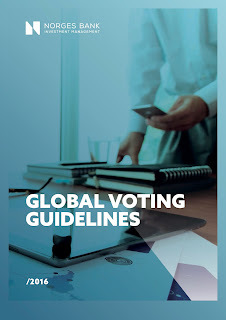 This post describes and considers the Global Voting Guidelines and their effect on the internationalization of corporate governance through the private economic activities of states. It is an excellent example of the application of regulatory governance at the implementation stage--where the state serves as the aggregator of internationalized standards, which it constructs to suit its own tastes, and thus constructed uses its investment ministries not merely as oversight agents but as active agents, exercising discretion in the form of shareholder rights to participate and exit. But there is a twist--the objectives are not purely economic--that is strictly focused on shareholder wealth maximization. Rather, voting is grounded in long term shareholder value enhancement through assessments of environmental and social risk. Our voting seeks to further the long-term economic performance of our investments and reduce financial risks associated with the environmental and social practices of companies. (Ibid.). From the perspective of traditional investing, this represents something remarkable--but as well, a perspective that will likely become both a private and public standard of investment. That is the embedding of environmental and social factors as a function of investment risk. And that, in turn, is increasingly viewed as a function of the operational risk of enterprises --not just internally but across their production chains. Corporate social responsibility--understood as a range of behaviors with societal and environmental consequences, then, are transformed into elements of business risk--and thus transformed, can be quantified, assessed, measured, and to some extent avoided or mitigated in both business operation and in investment decisions. How does one identify business risk with societal and environmental characteristics? For SWFs, the answer lies in the normative universe that has been produced as a function of the internationalization of corporate social responsibility norms, human rights and environmental standards. "Internationally recognized principles, our expectations, positions and guidelines serve as the foundation for our voting decisions." (Global Voting Guidelines, p. 2). Those norms and standards are identified as the producers of risk against which conduct ought to be measured. And as a consequence they assume a legislative character for the internal operation of the enterprise--and the regulation of its supply chain. This is how investment funds and enterprises make law that is then privatized in its imposition and implementation. Voting is one way that SWFs seek to embed their view of the law, applied as elements of operational risk in the economic, societal and environmental spheres. It represents the projection of state policy through the private activities of governments within enterprises that seek to embed public policy, and develop private law and business conduct standards, through the shareholder relationship. For the Pension Fund Global, the internal standards that guide business approaches to risk and risk mitigation is set out in a set of legalized norms--legalized in the sense of their governance effects within the enterprise. We vote in the fund’s long-term interests. Accordingly, we will vote in a principled and consistent manner to maximise the long term performance of the fund. As a starting point, and where appropriate, we will base our principles and voting decisions on internationally recognised standards, such as the G20/OECD Principles of Corporate Governance, UN Global Compact, UN Guiding Principles for Business and Human Rights, and the OECD Guidelines for Multinational Enterprises. (Global Voting Guidelines, p. 3). The effect is to legislate indirectly--certainly the Norwegian state has neither adopted these instruments as the domestic law of Norway, nor do these have legal effect in international law. But they do have governance effect when adopted and imposed as part of the rules of investment that are then treated as law--in the sense that their application is a necessary condition for investment decisions, and thereafter guide the relationship between the fund as institutional investor and the enterprise. How do these translate into specific conduct norms for risk mitigation and business behaviors? That is what is taken up in the bulk of the Global Voting Guidelines, pp. 4-9). These are divided into four action areas: (1) the board (pp. 4-5); (2) shareholder rights and equitable treatment of shareholders (pp. 6-7); (3) reporting, accounts and audit (pp. 8-9); and (4) sustainable business practices (p. 9). The relationship with the board is framed in terms of mutual obligation built around substantial spaces for discretionary decision making by by the board. That is, the expectation is that shareholders determine the overall objectives and the board has substantial discretion to ensure that the enterprise meets them. Most decision-making authority must therefore be delegated to the board of directors. For this delegation to function effectively there need to be a high degree of board accountability towards shareholders. Boards should demonstrate commitment to creating long-term shareholder value, ensure business execution in line with communicated strategy, satisfactory financial outcomes, and company communication to the market in a timely, adequate and transparent manner. Boards should also demonstrate that they have considered the interests of all shareholders in their decision making and that they seek to treat shareholders equally. (Global Voting Guidelines, p. 6). More widely, unsatisfactory financial and strategic results, mismanaged risk taking, the unacceptable treatment of affected stakeholders or other undesired outcomes will be taken into consideration. (Global Voting Guidelines, p. 5). Lastly, the SWF takes an interest in executive remuneration, which looks to pay seeting as an open and transparent process designed to provide executives with incentives to serve the long term interests of the enterprise. "This may result in Norges Bank Investment Management voting against re-election of remuneration committee members, or any director responsible for remuneration in those markets where a remuneration committee does not exist" (Ibid). These standards combine both specific requirements (e.g., the remuneration committee), with ambiguous standards ("mismanaged risk). Those ambiguities might be resolved on the basis of the international standards embraced and identified by the SWF (Ibid., p. 3). The way those standards are applied through voting decisions, remains unspecified. The standards relating to shareholder rights and equitable treatment of shareholders (pp. 6-7) include more specific conduct parameters touching on shareholder voting rights. • approve changes concerning capital structure. costs or other distortions. (Ibid., p. 6). • other control-enhancing mechanisms. (Ibid). Lastly, the SWF as shareholder would advance notions of equal treatment of capital, moving away form differential rights structures, promoting equal treatment in acquisitions and divestitures, the allocation of income and preemptive rights (Ibid., p. 7). The emphasis on transparency measures is also emphasized through corporate governance touching on reporting, accounts and audit (p.8). Interestingly, the application of the equal treatment objective in reporting moves the SWF to insist on reporting in English ("Real-time and complete presentation of English-language information facilitates equal treatment of local-language and international investors." (Ibid)). Transparency also includes the incorporation of codes of conduct. "In those markets where a corporate governance code is recognized, companies should disclose whether they are in compliance with the local code of best practice. Any deviation should be identified and explained in a transparent manner." (Ibid., 8). Lastly, sustainable business practice (p. 9) provides the focus for the emphasis on risk mitigation and societal and environmental effects. It is here that the internationalization of corporate governance is privatized within the governance structures of the enterprise and its supply chains. But this is only a "first step towards better management of associated risks. This includes risks related to climate change, water, and child labour and human right violations. "This is a substantial and deep mandate for risk assessment, compliance, mitigation and reporting. There is no specification about the way that this is to be accomplished. And that opens a window onto one of the great challenges in the global efforts to reform corporate governance and to manage supply chains--whether directly through enterprise governance, or indirectly through investment conditionality and the exercise of shareholder rights (as we have been exploring here). .
One would think that this would be most effective where risk assessment is quantified, and embedded in measures of financial performance. However, most groups have still consider qualitative reporting sufficient. I have suggested that the risk of window dressing is not negligible under that regime and that efforts ought to be made to both quantify and embed risk (societal and environmental) in financial reporting. (See HERE). The problem, of course, is that civil society tends to be suspicious of such approaches --especially risk based and quantifiable approaches--because it might suggest that rights compliance is negotiable, or that, if the benefit is great enough, that business could still engage in conduct that violates human rights. The difference in perspective, language, outlook and approach, then, marks a large divide between the business community and civil society that remains difficult, at best to overcome. It is likely that as implementation of international standards become more deeply embedded that these cultural divisions will produce substantial points of disagreement about the methods and approaches to enterprise compliance with international standards. The Norway Pension Fund Global Global Voting Guidelines provides a useful means of privatizing and institutionalizing norm frameworks that have, to date, been remarkable failures at traditional law making--either at the domestic or international level. But that failure--and this approach--also illustrates the difficulties when enterprises and civil society, much less states and the investment community, embrace quite distinct cultures of governance, law, risk and management, even on a global scale.